I will review a MUA product today and just like the previous one it is also a “thumbs up” product. Yes, it is!! 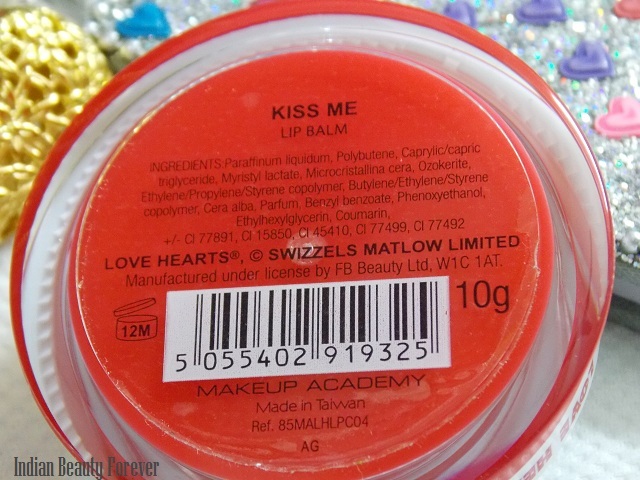 I am talking about the MUA Love hearts lip balm in Kiss me. Kiss me is actually is the name given to the shade. Quite interesting! Isn’t it? 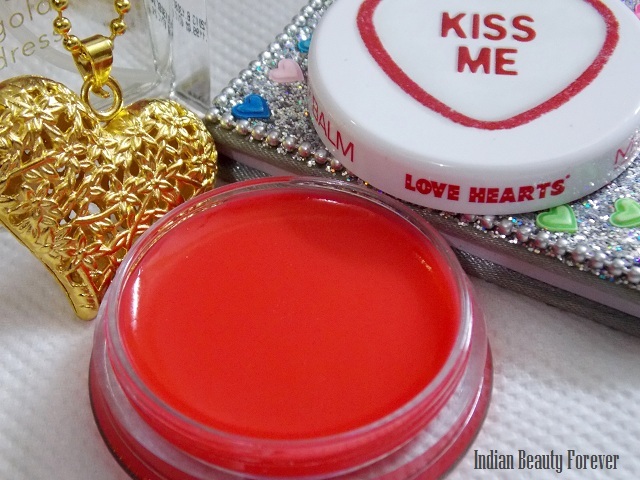 Dry, chapped lip isn’t cool and may also ruin the finished look of your lipstick, hence lip balms are very important. Most of the times, when I don’t feel like wearing lipsticks then these tinted ones can be handy. Price- It is for 2 pounds excluding shipping. 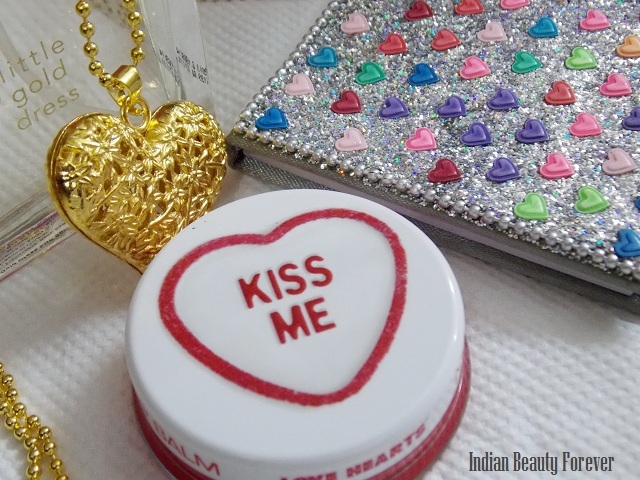 Kiss me Yaay!! I bought this one. 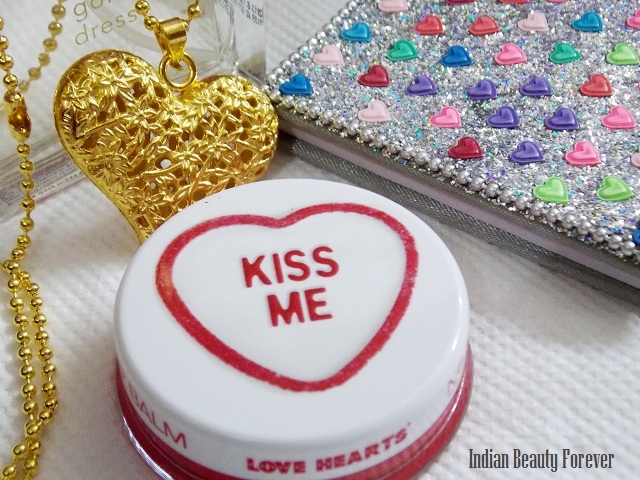 Experience- These love heart lip balms comes in a wide but shallow tub with a white lid that bears a heart which says “kiss me” that’s what the name of the shade is! Huh! Quite interesting shade name by the way! It smells like vanilla and caramel, very pleasant and mild. I will give it full points on packaging even though it is a tub one and I being not a fan of tub packaging, still loved it. Why? It’s because, the tub is wide enough but not too deep, due to which when I try to take out the product, my nail doesn’t get filled up with the product. When that happens, it can be a yuck feeling. But with this, I have to just rub my finger and apply the balm on to the lips. I don’t have to dig my finger! The similar packaging is also seen in the new Nivea lip balms. It’s sleek and looks really good that can be carried in clutch and bags. The lip balm in the shade “kiss me” is a reddish pink thick balm which I feel has a consistency and texture similar to that of a lip balm and lip gloss. It doesn’t feel heavy or sticky at all, gives a light tint to the lips and hydrates my lips for around 4 hours. The color that this balm gives goes away when the balm wipes off and lips are not stained with this product. Nope, it won’t stain your lips.I must say, it is even better than some of the lipsticks when it comes to staying power. 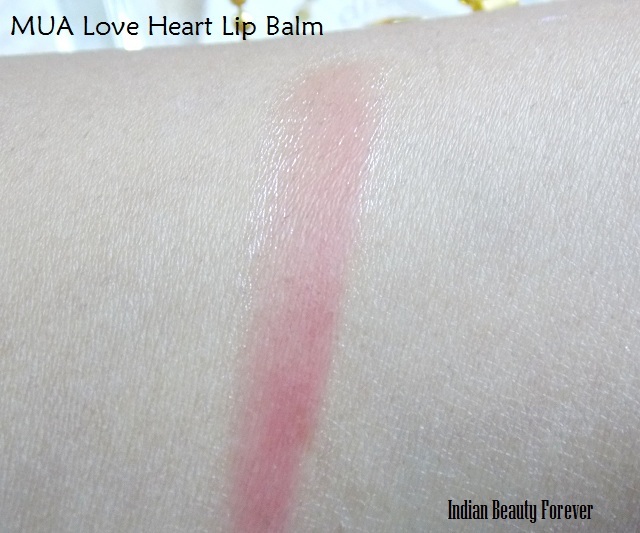 One thing I would like to mention that most of the colored lip balms are not moisturizing enough as compared with the colorless ones, I mean, after sometime you feel your lips are getting dry but with this one, I haven’t faced such! It will hydrate the lips and even when the balm wipes off; it leaves the lips smooth and supple. It lacks SPF but apart from that, this product is a total worth the money. Take- If you like colored lip balms that can give moisture to the lips and keeps them soft and well hydrated for a longer time, then you should definitely try this lip balm. Beautiful packaging and the mild fragrance makes it a worth the money. Its nice na!! :) You too have a great day dear! :) I will try to put the lip swatches. Looks like a nice product did you buy it online? I bought it from their official store. looks very yumm. the slight tint looks nice. and wait, that heart locket is too cute. is it on a long chain? or short like a necklace? hai na!! It looks delicious. :) Its actually a long chain pendant. Love the packaging so cute. looks good and love the pics! Thank you Manisha!! :) Err sorry you have to comment twice, its due to moderation!